The shirt Klose, Schweinsteiger & Müller will wear mostly in Champions League includes diagonal anthracite pin-stripes down the front, plus the woven initials ‘FCB’ on the back collar - commemorating the club’s 110th anniversary this year, and derived from Bayern’s founding charter from the year 1900. 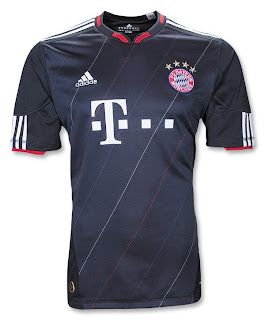 The design is a new take on the classic Bayern Munich striped jersey that dates back to the team's origins. Unlike the shirt from 1900, this one is made of adidas ClimaCool® - advanced material engineered to reduce heat and moisture build-up, allowing increased comfort and performance – to keep you feeling fresh no matter how long you play, train and cheer on your FCB!